Last week I spent a few days camping in the desert regions east of the Sierra Nevada, down to Death Valley. 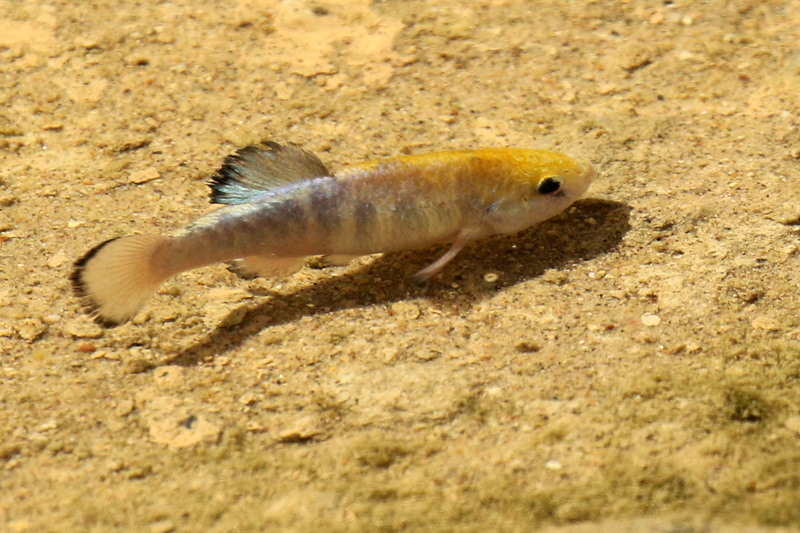 One of the highlights was viewing the endangered Salt Creek Desert Pupfish (Cyprinodon macularius). 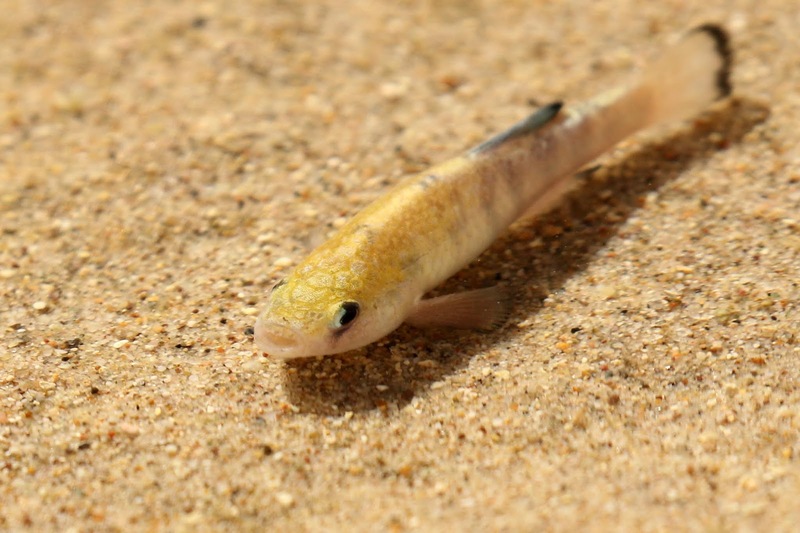 There are only a few populations left - remnants from the Pleistocene era Lake Manly. Lake Manly was a giant lake covering what is today Death Valley, to depths of 600 feet. A few thousand years later, it is gone, and all that remains are salt flats an ephemeral streams. Somehow these fish managed to adapt to the extreme temperatures, high salinity (3x that of the ocean) and seasonal nature of the waters. 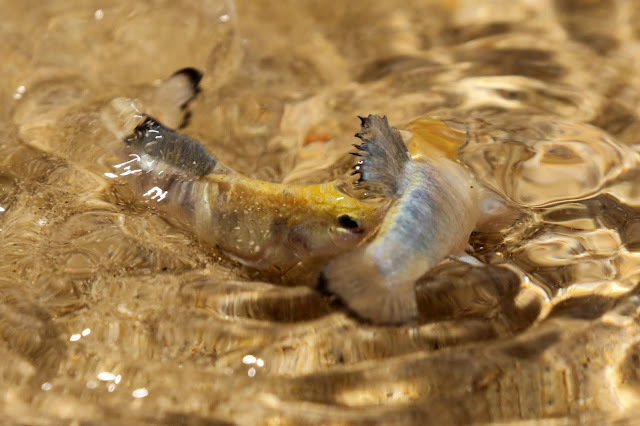 The pupfish are only a couple inches long, and defend small territories (a square meter or two) in the shallow creek. In fact, one of my pictures is a territorial squabble by two males. They only have a few months to mate and lay eggs before they perish. And the cycle starts again next spring when the eggs hatch and new generation repeats the task. 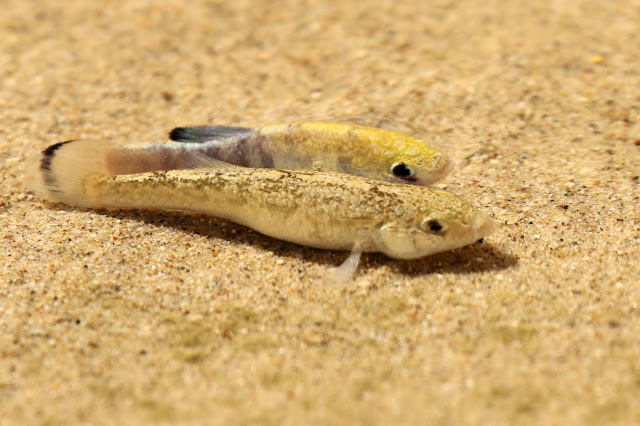 The only thing keeping this group of pupfish from being Critically Endangered is that there are two disconnected populations. Note that until recently, all desert pupfish were thought to be a single species with different sub-species that had slightly different life strategies. Recent DNA evidence has resulted in them being split into three distinct species. That said, it was discouraging to see people walking in and along the creek, despite signage saying not to. Thankfully it is only early April - in another few weeks each step they were taking would likely crush dozens of pupfish eggs. This week I was told of a fascinating Radiolab podcast - titled "The Beauty Puzzle". The podcast looks natural selection through a very interesting lens. 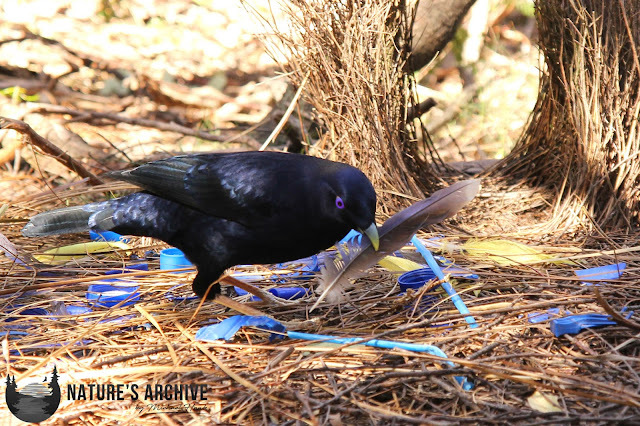 I don't want to spoil the episode by recounting it here, but I will say that they spend several minutes discussing the Satin Bowerbird. 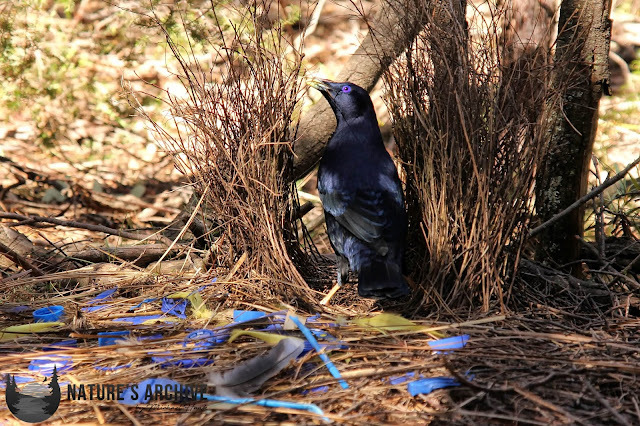 These amazing birds create an elaborate display, called a bower. There are many species of bowerbird, each constructing a bower with a different architecture. This one creates an avenue bower, consisting of sticks that basically form two walls, creating a pathway. The bird creates an expansive floor (called a platform) with sticks as well, and then decorates the scene with blue items. Above you can see the bird at work, with the bower behind it and to the right. 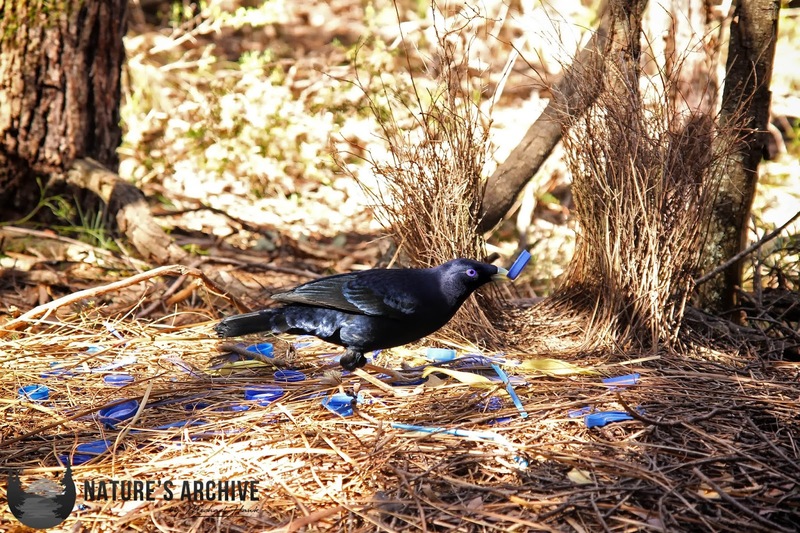 Historically, the bird would have to work hard to find blue items in nature - perhaps flower petals or berries. These days, human trash, mainly in the form of plastic bottlecaps and straws, has filled the niche. But there are a couple blue/purple feathers in the mix as well. Look closely and you'll see some yellow items. These are Sulphur-crested Cockatoo crest feathers. There were at least a dozen in the bower - it makes you wonder if it raids Cockatoo nest areas, or just has a keen ability to find these scattered about the wild? 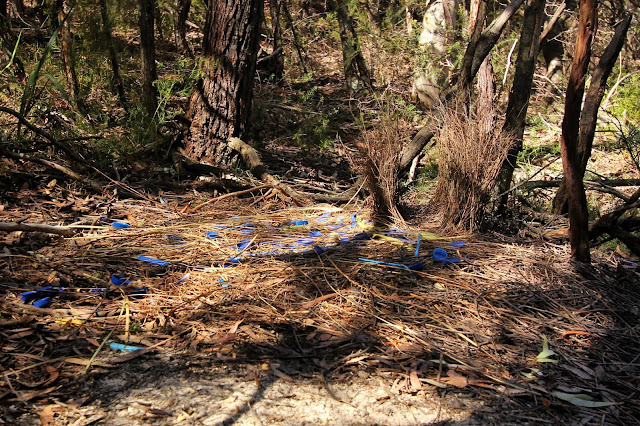 When at the site, the bowerbird maintains a tidy bower. Sticks and leaves that fall or blow in are quickly removed. And time is spent putting any misplaced blue items back in their original spot. This is the entire scene of the bower. It's hard to tell, but some of the low branches have bark that was torn off and fluttered in the wind. It was as if the bird had created little flags to further enhance the bower. 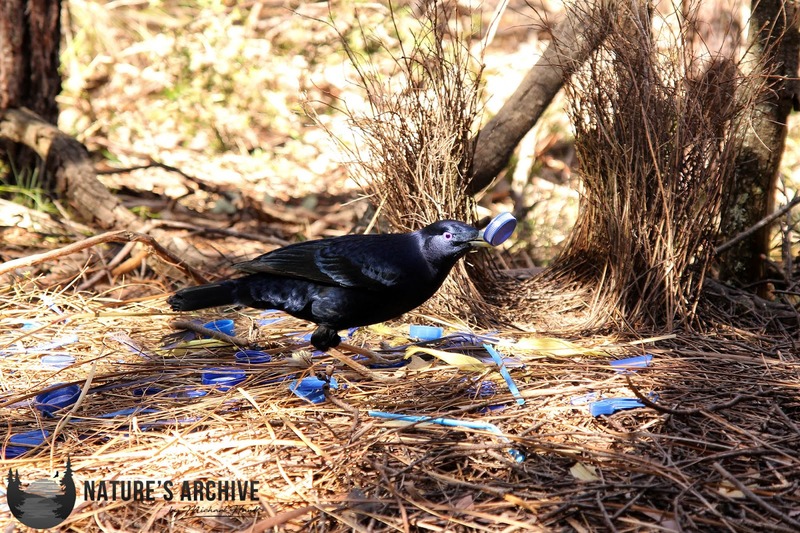 This bower was located in New South Wales in a Eucalypt forest edge - typical habitat for the Satin Bowerbird. The bowerbird is a large bird - somewhere between the size of a typical american Jay and an American Crow. Like many birds, there are sub-species as well, and these sub species sometimes decorate differently, lining the platform with moss, or picking other colored objects. Hi Again! I've been wanting to post for quite awhile, but have been waiting for a time when I can be consistent with it. I think that time has finally come! Over the next few months I plan to recap my two weeks backpacking in Arizona from last year, give a closer look at some wonderfully unique animal species I've encountered, and sprinkle in a few fun wildlife photos here and there. 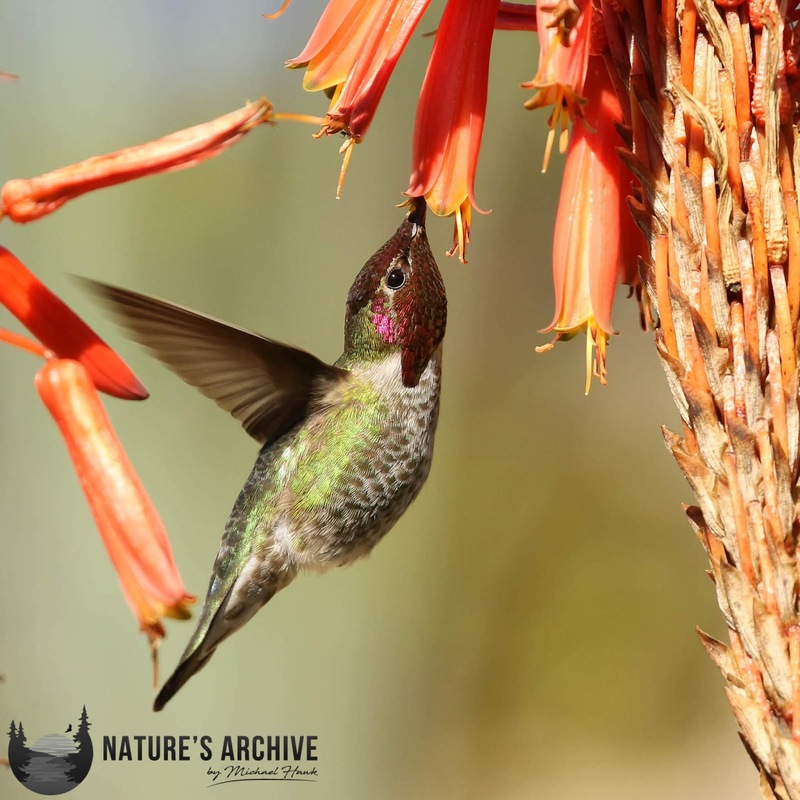 At the same time, I'm performing a slow, steady makeover of the design and layout of this blog, Nature's Archive Photography, and my Facebook and Instagram presence. Please follow along - and please provide your feedback, thoughts, and questions! As a hint of what's to come, here's an Anna's Hummingbird from a recent excursion. 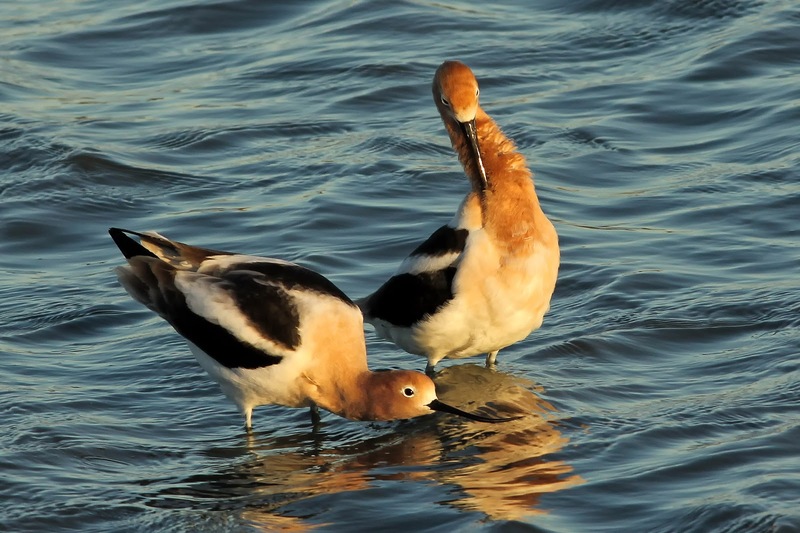 Last month one morning, shortly after sunrise, I was able to witness the intricate American Avocet mating behavior. I suppose you can say spring has sprung. These two photos show the female in a submissive posture with her bill just above water line. 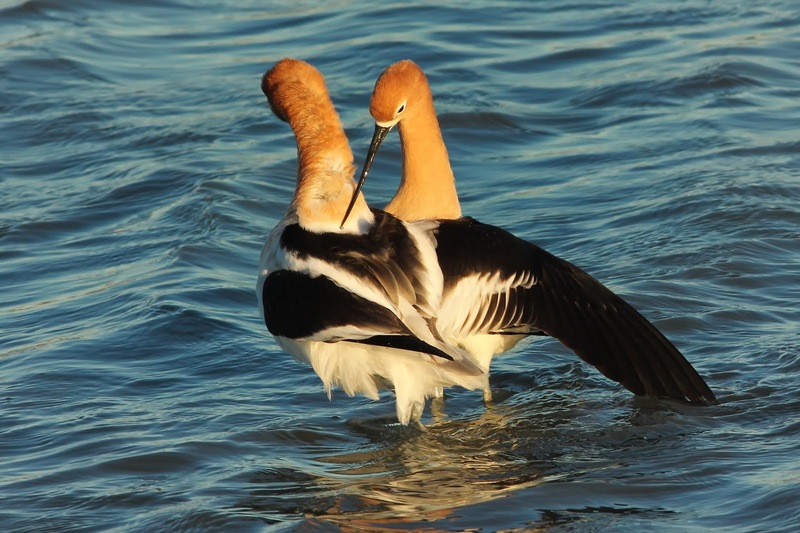 When she gets into this pose, the male with which she has already formed a pair/bond, gets the signal and begins preening in-preparation, moving on both sides of the female. After a few minutes of the preening, they mate. This is followed by a brief period where the male drapes his wing over the female, and they cross bills together. 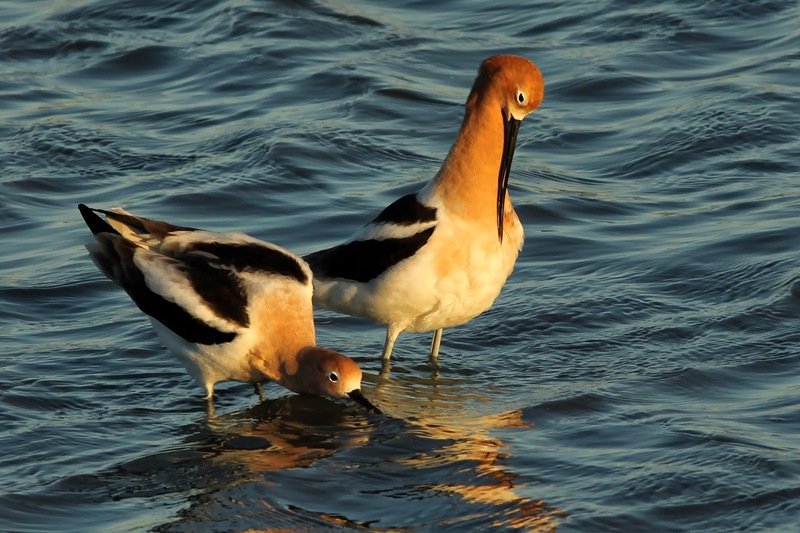 It is an amazing sight to see, and apparently this ritual is repeated by most Avocet pairs. It is easy to anthropomorphize these birds when you see these behaviors and the tenderness that they seemingly show. There is much to learn about (and from) the natural world. I love to hike. In fact, I try to take a 5-10 mile hike each weekend. I just can’t think of a better way to get a few hours of solitude, while also getting great exercise, and an excuse to observe and photograph nature. Today was no exception - I decided to do a ~9 mile hike at one of my favorite nearby locations - Rancho Canada del Oro. At about a 15 minute drive from my house, it offers convenient access to pristine hiking. There are many points in the preserve where no signs of human activity are visible. No roads, no buildings, no power wires, and no other people! I was about 4 miles in, marveling at the scenery. If I’m generous, it has rained about .05 inches since May 1. Yes - 4 months of no rain, but plenty of sun and heat. Yet, all around me, life was flourishing. Hundreds of butterflies fluttered at my feet, dragonflies patrolled their territory, and lizards scurried to hide when they detected my footsteps. Sporadic wildflowers still bloomed amid the golden brown sea of parched grasses. It was amazing to think about the delicate balance that must exist to allow all of this to persist during our annual summer drought. I reached the highest point of the hike, almost 2000’ (about 1400’ elevation gain from the trailhead). Starting to head downhill, to my left was a low, wooded canyon, and to my right, steep grassy peaks (called the bald peaks). Just then, breaking my solitude, a large animal bounded down from above and onto the trail no more than 15 feet in front of me. It hurried over the side of the slope and down, out of site. My first thought was “wolf”, but I immediately knew there were no wolves here. Then I replayed the scene in my mind, and realized it had a massive tail. Mountain lion. 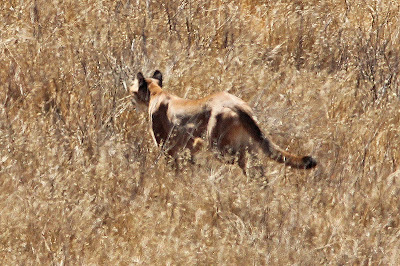 Having an appreciation for nature and hiking, I’ve read a lot about mountain lions. 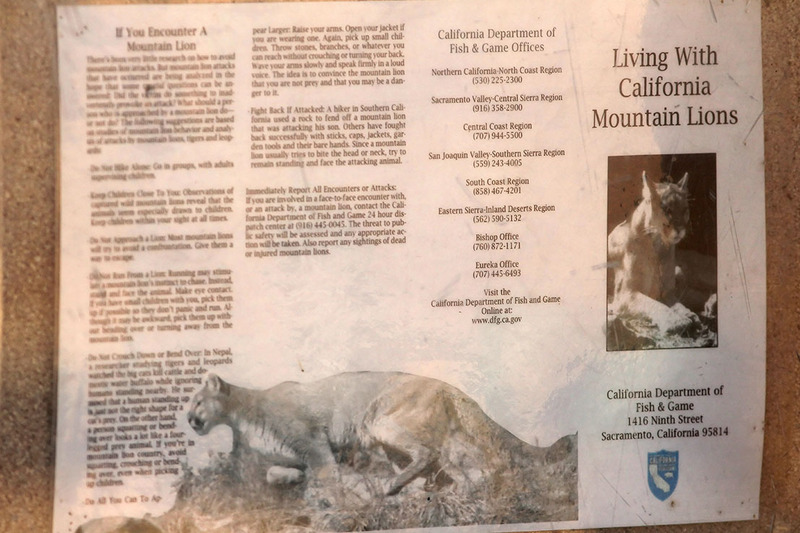 I know a fair amount about their life history, and have read my fair share of stories of mountain lion attacks. 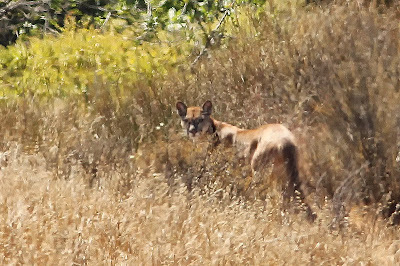 In fact, I know that far too many of the stories of lions attacking humans follow this scenario: solitary hiker/biker out in a secluded area of wilderness; a long, dry summer has left the mountain lions at their most hungry and desperate. Along comes an unsuspecting meal out for a hike or bike ride, and the rest is a story for the newspaper. Over the years, I’ve had encounters with snakes, coyotes, hormonal elk, and bears (including a mother bear with a cub in Arizona). While these got the adrenaline running, I never felt threatened. But I’ve always had a bit of a fear of mountain lions. They are the only animal of the group that occasionally thinks of people as food. With all of these thoughts circulating, I cautiously approached the trail’s edge and picked up some large rocks. I peered over the edge, hoping the lion wasn’t laying in wait for me to do just that, and saw the lion snaking its way further downward in the grass. At about 50 yards, it stopped, turned around and looked at me. Knowing my mountain lion stories, I threw rocks at it to scare it away. I didn’t get close, but it got the message and continued downward. At about 100 yards, it stopped again and took a look back at me. At this point, I felt safe enough that I’d grabbed my camera and tried to take some shots of it. With the exposed landscape and temperatures approaching 90, I could see the heat waves radiating off the mountain side. Looking through the viewfinder, it was as if I was in the African savannah, looking at lions through the heat of the land. While he was staring, I was thinking about the primitive thoughts he was probably having - sizing me up, considering whether I am food or foe. After a few seconds of more staring, he disappeared into the woods below. At this point I still had 4.5 miles back to the car. The question was - which route? My intended direction was downward, with the trail switchbacking back and forth across where the lion had just been. Or I could turn around, but have to cross the entirely exposed bald peaks in the heat. If I continued on my original route, I’d also be much more likely to encounter people as I’d get to more popular trails. I decided to continue on my original route. I thought about some deer I’d seen earlier, and thus, there was plenty of food for the mountain lion - he probably wasn’t so hungry as to care about me. If he wanted me, he had already had its chance. I picked up rocks to throw if I saw him again, and found one larger rock with a nice pointy edge, should I need to defend myself. I couldn’t avoid thoughts of what to do if I saw him again, how to avoid seeing him again, and what to do if it surprise attacked me (which is the usual modus operandi). I knew that I needed to protect my head and neck and fight back. I figured I’d hit it with the sharp rock, yell, kick, scream. I’d try to gouge its eyes, and use my heavy 300mm camera lens as a baton. As I walked, the mountain lion took on supernatural qualities in my mind. Its stealth, speed, and strength were undeniable. I was relegated to a path of switchbacks on a mountain side, but he could simply bound straight up or down the mountain side. I remained vigilant. I occasionally looked over my shoulders, scanned for movement, and kept my rocks handy. Every towhee scratching at leaves looking for an insect meal, or lizard rustling leaves to escape my threat caught my ear. Slowly, I progressed through the canyon bottom, and up the other side. I was now in an area of the preserve where cattle grazed. Lucky me! Now instead of 3 foot tall vegetation, a summer’s of cattle appetites had mowed the landscape to the soil, with only short grasses and sparse wildflowers growing a couple of feet. Slowly, I felt more at ease, and more relaxed. I crossed a recent wildfire area, and after another 30 minutes of steep terrain, was back at my car. Of course, I took a moment to re-read the ubiquitous warning that most of the area parks have. As a fun home project, my daughter and I decorated and hung a chickadee house this spring. Within a few days, we had a chestnut-backed investigating it. We watched the Chickadees faithfully bring supplies into the house, and then eventually started hearing the peeps of chicks. The peeps grew stronger and louder for about 2 weeks, and then one day stopped. 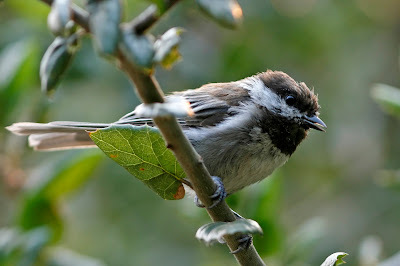 It seemed the chickadee family had successfully raised their young! On the unlikely hopes that a second family will still rear young, we cleaned the house out yesterday. The nest they had built inside was amazing - made of animal hair and a little bit of grass. The nest extended to the corners of the house, packed very tightly. 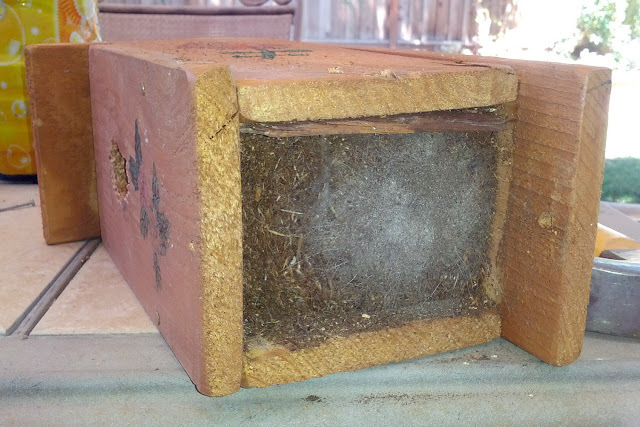 We took the nest out, and it was concave in the middle. It was quite clean - just a couple droppings that likely were left the day the birds fledged. 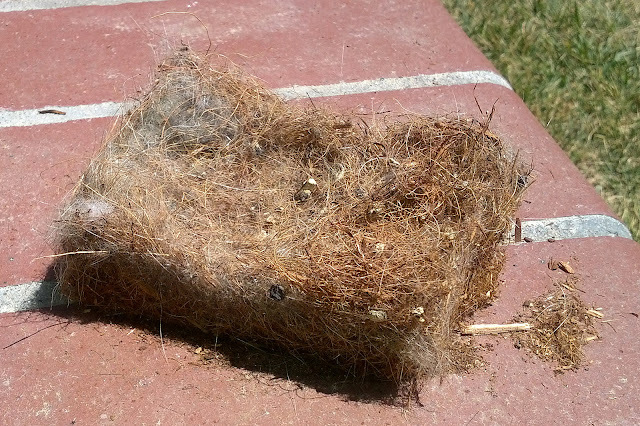 You can see the grey animal hair well on the left side of the nest, but when viewed in person, it was obvious that the nest was probably 60% or more animal hair. 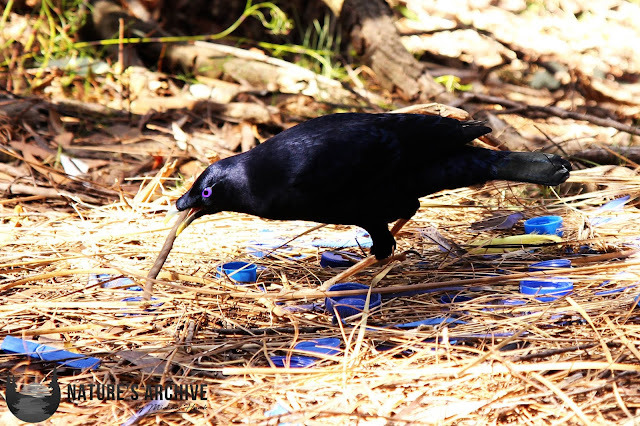 This was a good reminder at how resourceful birds are in finding the materials they prefer (or need) for nesting and eating. My daughter and I had a great time building and decorating the house, and we took care to research proper placement. It all paid off, and we're looking forward to being the landlord for more bird tenants in the future!